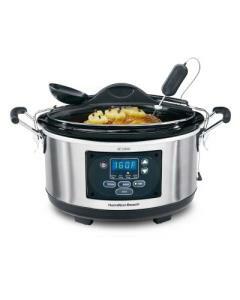 This Hamilton Beach model is a six quart programmable cooker with a flat LED digital control panel. It allows you to set three cooking options (Program, Manual, Probe). The set comes with a thermometer probe for meat, a clip on spoon, and a clip tight lid with gasket seal. It offers an automatic keep warm function and power interrupt protection. There are side handles to help in transporting the unit. The stoneware insert and tempered glass lid are dishwasher safe. The crock is also microwave safe and oven proof (note: the lid is not safe for either). A one year limited warranty and recipes are included. Using the meat thermometer probe combined with the Probe Mode setting allows you to cook meat to a certain internal temperature. No need to guess or hope you've cooked a large piece of meat thoroughly. The Manual Mode allows you to reheat foods or cook traditionally without setting a time. With it you can choose a high or low setting. If you'll be away, the Program Mode allows you to set the cooking time and the cooker will adjust to Warm when the food is finished. The manual offers a step by step guide for each setting and a chart for cooking temperatures. The gasket really keeps the juices (and flavors) inside the pot and in your food. The clips assure transport without spills. Overall, a solid product with great improvements on an already very functional design. It's a must-have.